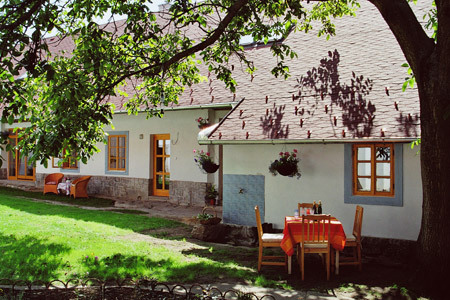 This special offer is for visitors who wish to spend a couple days or more in the peace and comfort of South Bohemia. This is a great place to get better acquainted with this country. The farmhouse has 10 newly reconstructed and beautifully appointed double rooms, with private bathrooms. 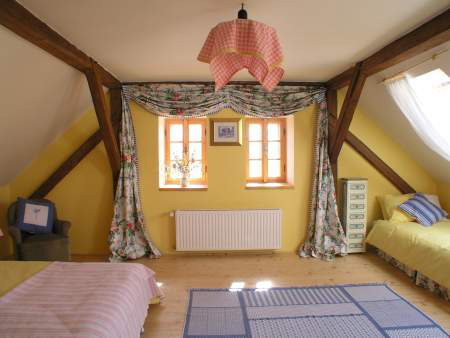 Each room is decorated in a traditional English style, with a subtle hint of the Czech countryside. This facility is best suited for individuals, couples, and families with children. There is also one room specially equipped with barrier free access for guests with special needs. 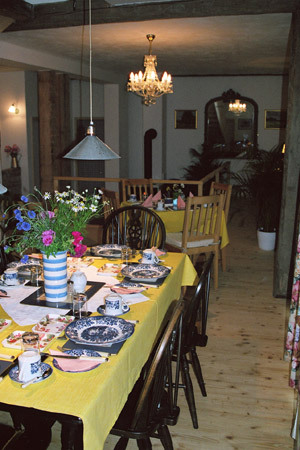 There is a large common dining area where breakfast, as well as other meals may be served. You only have to tell us on a daily basis how you prefer to arrange your other meals. Food and drinks in Czech restaurants, is very reasonably priced. There are also several restaurants within a few minutes drive or bicycle ride. A bagged picnic style lunch may also be possible, given sufficient advance notice, or dinner in-house. Tea and coffee are always available in the kitchen for you to help yourself. Either way, there is always our Barbeque, once per week with different themes and activities. Evenings can be spent enjoying the company of the other guests, reading in one of many quiet nooks in the courtyard, or sitting at the bar, playing cards, with a nice log fire in the background.